English rabbi; born in London 1848. He was educated at Jews' College, received his rabbinical diploma in 1890, and has occupied successively the positions of head master of Jews' College School, and minister of the Borough New Synagogue and of the New West End Synagogue. He is a member of the committee of the Jewish Education Board and of the council of Jews' College, president of the Jewish Ministers' Union, and honorary secretary of the Jewish Provincial Ministers' Fund; and he is regarded as the foremost representative of progressive Orthodoxy in the Anglo-Jewish community. 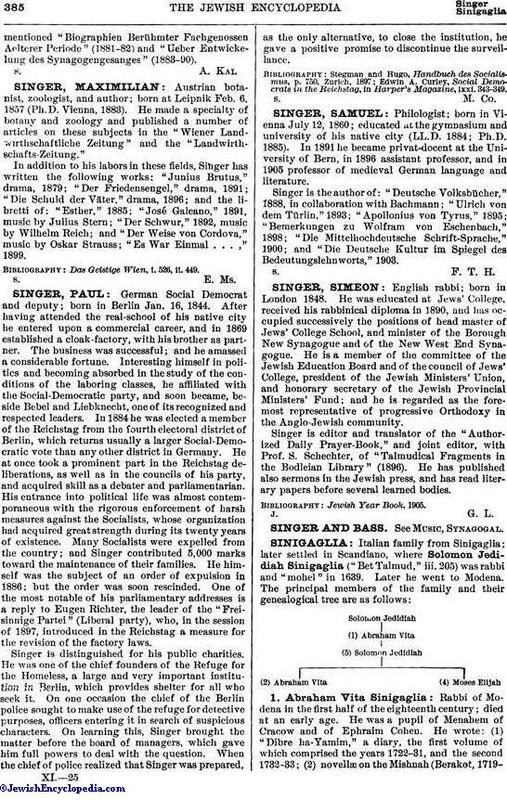 Singer is editor and translator of the "Authorized Daily Prayer-Book," and joint editor, with Prof. S. Schechter, of "Talmudical Fragments in the Bodleian Library" (1896). He has published also sermons in the Jewish, press, and has read literary papers before several learned bodies.